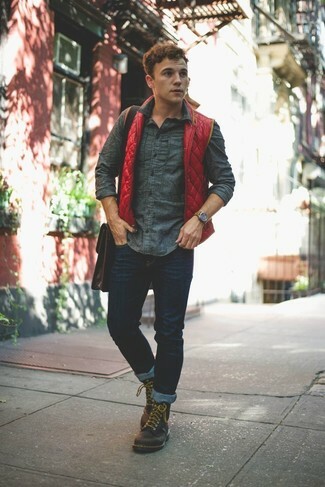 If you're all about being comfortable when it comes to crafting an outfit, this combination of a red gilet and a dark brown leather briefcase is right what you need. Channel your inner Ryan Gosling and go for a pair of dark brown leather casual boots to class up your outfit. If you're a fan of practicality dressing when it comes to your personal style, you'll love this killer pairing of a navy blazer and a Bosca triple compartt leather briefcase from Nordstrom. You could perhaps get a little creative when it comes to footwear and lift up your ensemble with brown suede oxford shoes. 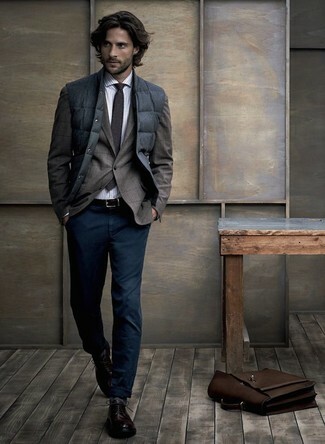 If you prefer practicality dressing when it comes to fashion, you'll love this knockout pairing of a charcoal gilet and a dark brown leather briefcase. Bump up the cool of your outfit by wearing dark brown leather derby shoes. 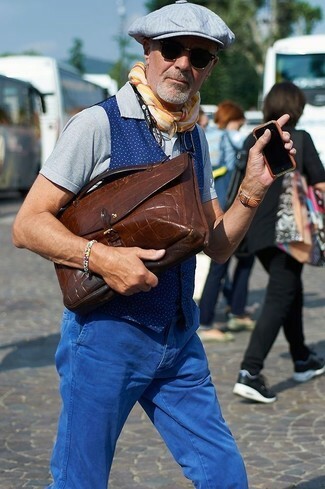 If you're after a casual yet seriously stylish ensemble, make a blue polka dot waistcoat and a Bosca triple compartt leather briefcase your outfit choice. Both garments are totally comfortable and will look great paired together. 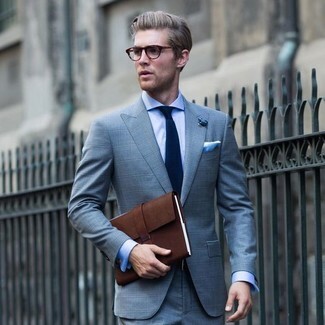 If you're scouting for a casual yet seriously stylish ensemble, rock a grey suit with a Bosca triple compartt leather briefcase from Nordstrom. Both items are totally comfortable and will look great together. 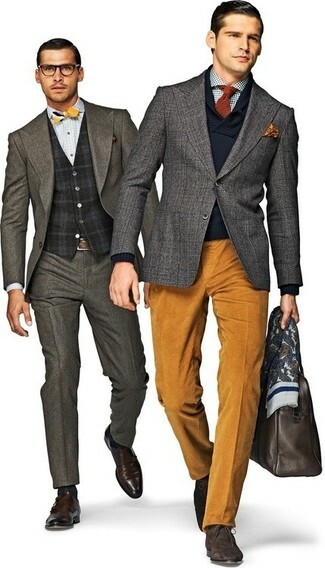 When it comes to footwear, this look is round off nicely with dark brown leather driving shoes. 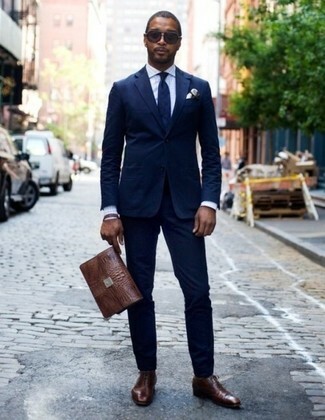 If you're on a mission for a casual yet seriously stylish getup, choose a light blue plaid suit and a Bosca triple compartt leather briefcase from Nordstrom. Both pieces are totally comfortable and will look great paired together. 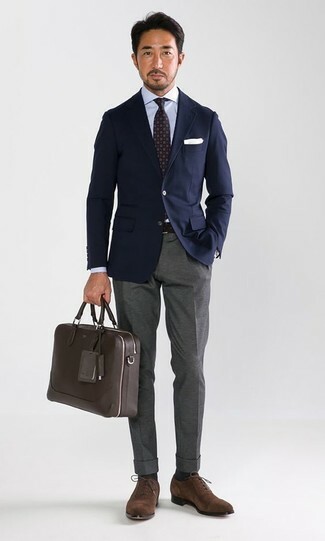 If you're hunting for a casual yet sharp ensemble, reach for a navy suit and a Bosca triple compartt leather briefcase from Nordstrom. Both garments are totally comfortable and will look great together. Play down the casualness of your ensemble with dark brown leather oxford shoes. 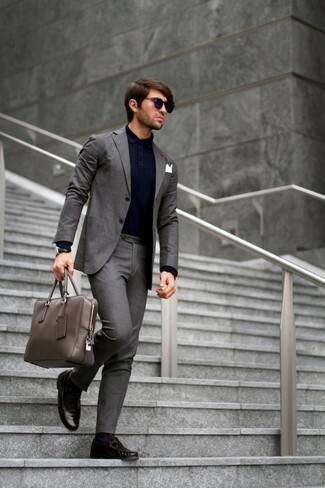 If you're a fan of relaxed dressing when it comes to fashion, you'll love this simple pairing of a grey blazer and a Bosca triple compartt leather briefcase. Make brown suede casual boots your footwear choice for a masculine aesthetic. 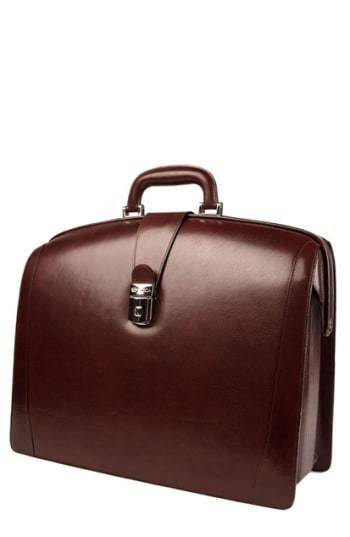 For a comfortable-as-your-couch outfit, pair a camel overcoat with a Bosca triple compartt leather briefcase from Nordstrom. 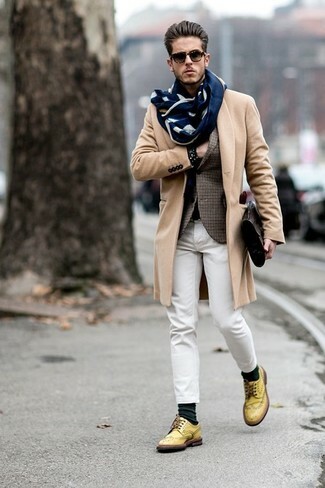 And if you want to instantly kick up the style of your look with one piece, add yellow leather brogues to the mix.